Star Wars led to countless insane knock-offs, including some hilariously cheap Italian films. 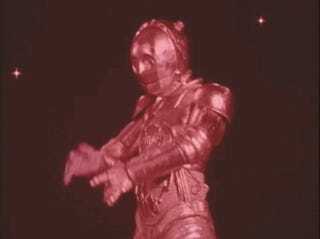 But the most shameless and terrible Star Wars ripoff might actually be this 1978 infomercial from Taylor Wines, featuring “Metal Man” and “Shorty” disco-dancing and helping some dudes talk about how to sell more wine. 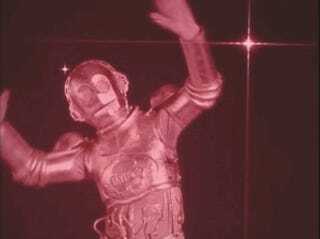 This marketing film from Dallas Production Company, Bill Stokes Associates, highlights the impact of new ideas and new material for Taylor Wines as they compete in the 1978 “Holiday Race for Space,” a somewhat inexplicable marketing scheme that is described with the aid of “Metal Man” and “Shorty,” an obvious homage to Star Wars characters C-3PO and R2D2. Join the marketing team at Taylor Wines as they look at new packaging and displays, and Metal Man and Shorty dance to groovy 70s tunes and get love from the ladies! Also included are previews of the new Taylor Wine holiday commercials, one of which features jazz pianist Count Basie.